Yeah, I know … been a while since I posted a new recipe. Been dealing with a family emergency. So, I deserve a little slack. 😉 To make up for it, I’m giving you a very tasty dish that really compliments just about any main course … beef, chicken, pork, fish, you name it! Preheat oven to 420°. Scrub and rinse potatoes. Then, cut them into bite sized wedges. LEAVE THE SKIN ON! Mince garlic and chop basil. 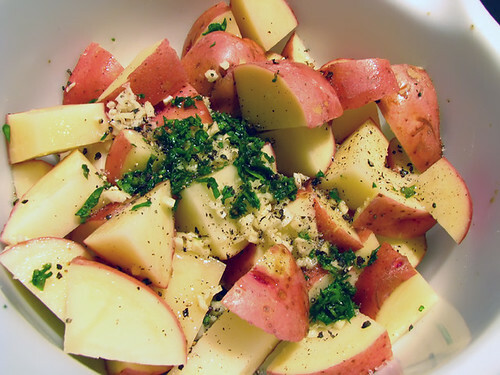 In a large bowl, place potatoes, garlic, basil, olive oil, salt, and pepper. Mix well until all ingredients are evenly combined. Evenly coat a large cookie sheet or baking pan with non-stick cooking spray. Evenly distribute them, trying to keep the skin side down. Place into oven. Bake for 30-35 minutes, until potatoes become golden brown along the edges (These probably could have used another 5 minutes, but everyone was starving and all the other dishes were ready 🙂 ). 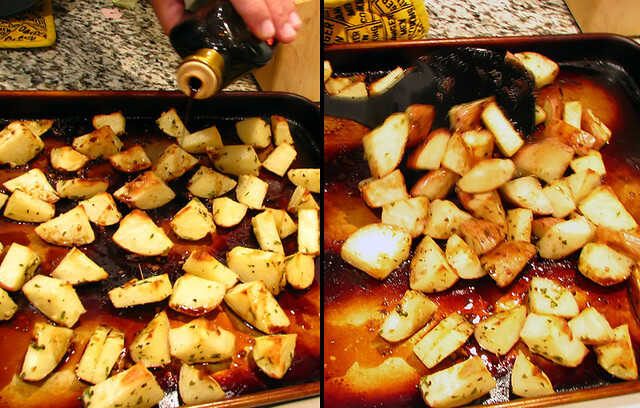 Remove from oven, and immediately drizzle balsamic vinegar over the potatoes. The vinegar should begin to sizzle and caramelize. 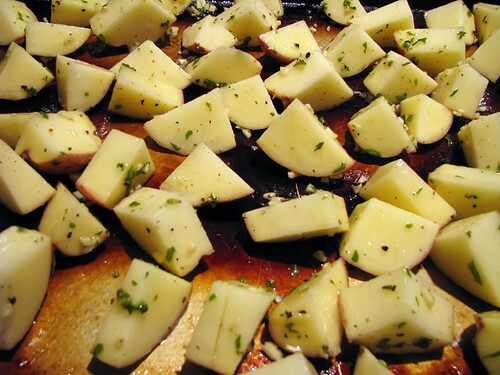 Toss the potatoes until they are completely basted in the vinegar. Serve potatoes with other dishes of choice. 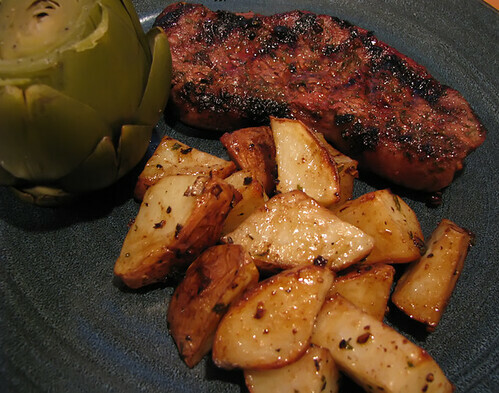 Pictured here with Steak ala Cave and a steamed artichoke. HINT: Got leftover taters? Just cover and refrigerate until morning. Then, in a skillet, saute some onions and minced garlic in olive oil and, when onions are translucent, add the leftover potatoes. Continue to cook until taters are thoroughly warmed. BOOM … now you have some incredible home-style Breakfast Potatoes! Talk to you in a few days! Super easy to make … but, also super easy to mess up! However, if you do it right, your taste buds will be doing a victory dance!! As I said, this is easy to mess up. The first step is crucial: choosing your Salmon filet. 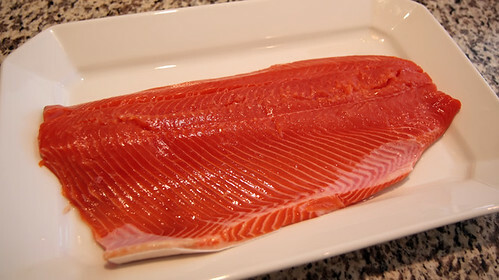 Make sure it is fresh, wild caught, and preferably Sockeye Salmon. 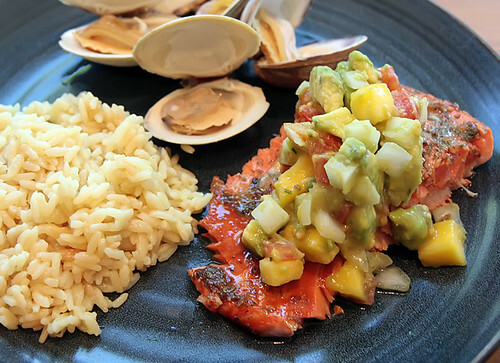 While any genre of this anadromous fish would work, there is something to be said about the incredible flavor and texture that the dark red meat of the Sockeye holds. 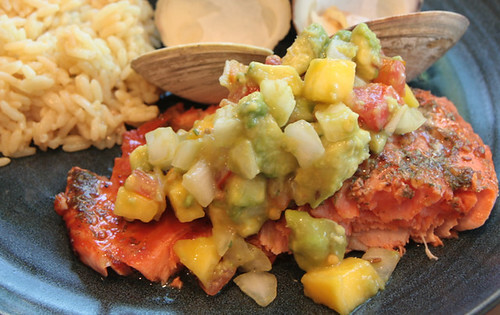 If you can get your hands on some Copper River Sockeye, it’s even better! DO NOT remove the skin. Place your filet, skin side down, on a suitably sized platter with raised edges. Cover with teriyaki sauce (I truly prefer the Trader Joe’s Island Teriyaki). Then, turn the filet over so that the skin side is now up. Cover with plastic wrap and refrigerate for no more than 20 minutes. NOTE #1: This is another step that can be easily bobbled. 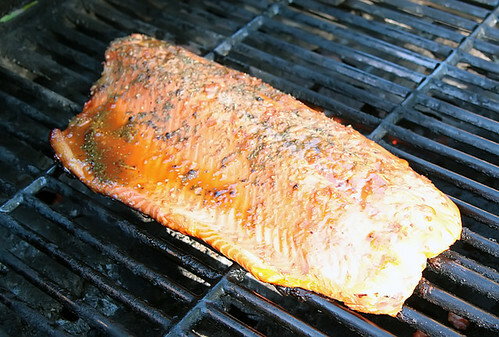 If you marinate the fish too long, the flesh can become mushy and loose all it’s natural flavor. The teriyaki sauce should compliment this dish, not dominate it! 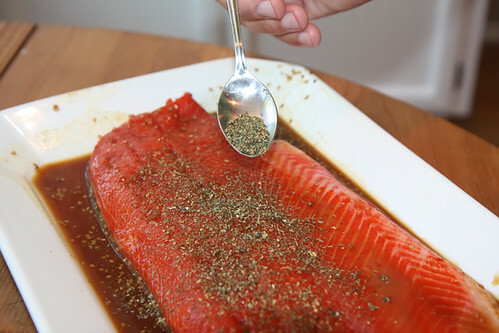 After marinating, turn filet back over (skin side down) and evenly sprinkle the Pacific Seafood Rub over the fish. Pre-heat grill to a medium-high heat (about 300° to 325°). 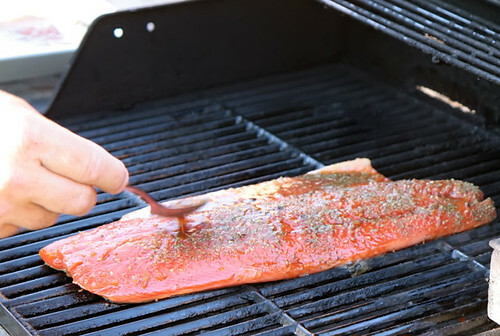 When grill is ready, create an indirect heat area for the fish and then coat the grill grate with non-stick spray. NOTE #2: As you can see the spray will create flame ups. Be sure to keep the can as far from the flame source as possible. Also, use short blasts of spray to prevent any dangerous flare ups which could cause you to loose your Caveperson coat (ie. singe your body hair)! 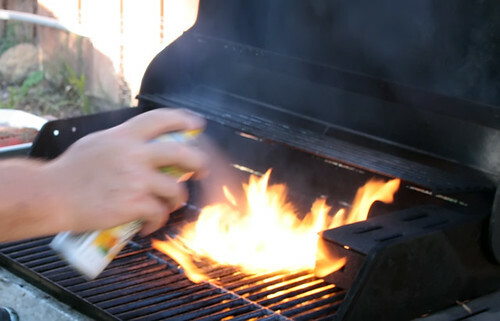 Place filet over the indirect-heat area of your grill. Spoon some of the extra teriyaki sauce on top of the fish. Cover grill and allow to cook for about 5 minutes before checking on the fish. Normally, it shouldn’t take more than 6-8 minutes to fully cook. Fish should have the beginnings of a nice crust on the edges and be firm, but not flaky, to the touch. If it’s still a little squishy, give it another minute or two. 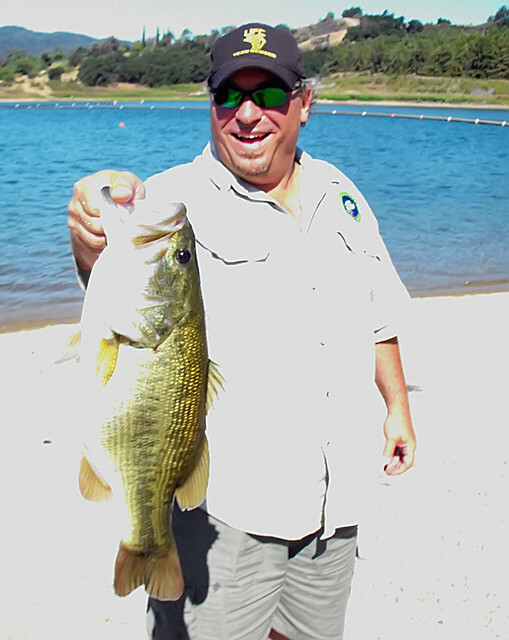 NOTE #3: This is the last step that could end up in fouled fish. Overcooked fish becomes dry and, again, looses much of it’s natural flavor. In fact, it’s better to undercook it rather than the reverse. Using a large metal spatula, remove filet from grill and allow to set for a minute. 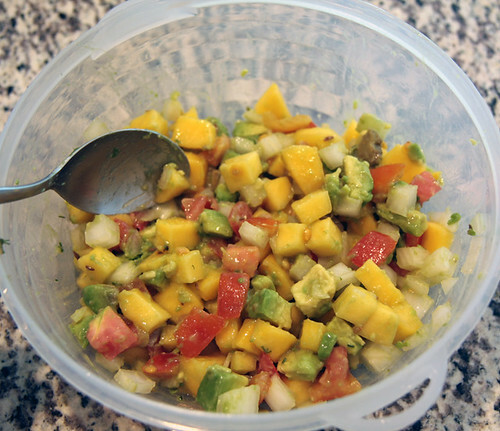 Then, cut into serving sized portions and top with generous scoops of Mangocado Salsa. Plate with your favorite sides. Pictured here with rice pilaf and fresh, steamed New England clams. 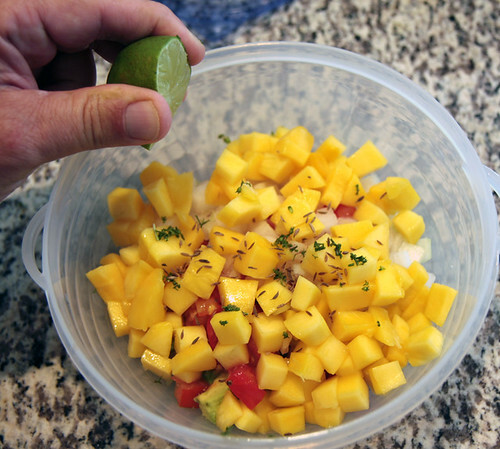 This ain’t your Mama’s Mango Salsa … that is, if she ever even made it! Delicious on fish, with tortilla chips, or just by the spoonful!! 😉 Best of all, this is super easy to make. Dice mango, avocado, tomato and onion. Place diced ingredients into medium sized bowl. Add cilantro, cumin seeds, and lime juice. Gently stir all ingredients together until mixed well.